This is the Palace Cinema, where I went to see Call Me By Your Name yesterday with my pal Lorraine. It’s very tall and thin, rising up three floors and down two, so if you want to go anywhere you have to channel “medieval lady of the manor” and haul yourself up and down millions of limestone steps. My neighbour Lelia was part of the Palace project from concept to creation, and I had sent her a congratulatory text a few days earlier after my first visit. We weren’t blown away by the movie but we had the lols, and the seafood chowder in the restaurant was superb. 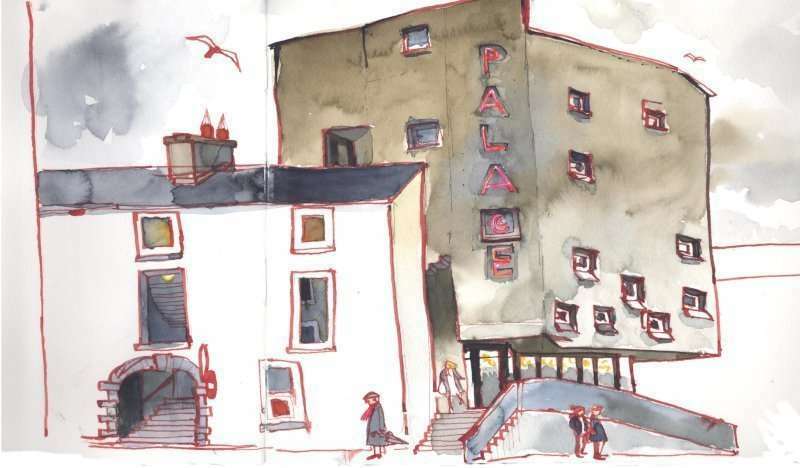 I drew the Palace today, but all my pens were empty and I had forgotten to bring any ink. The only pen I had was filled with red ink – waterproof, too, luckily. Later on, my husband Marcel and I were at the opening of an exhibition in Kinvara, a cute fishing village down the road from us. Our friend Heidi Reich had invited us. She is a true artist, with a wonderful eye, and one of the most honest people I have ever met. 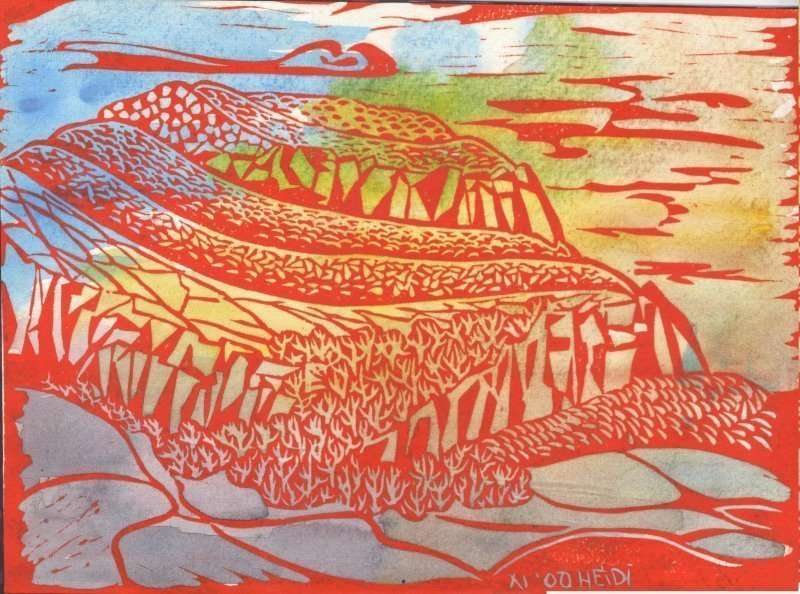 She is a print maker, and uses photographs as a starting point. As we all sipped glasses of wine, Heidi addressed us. Then Heidi said something surprising. I have never heard anyone speak so frankly about a collection that they were in the middle of opening. I am extremely inspired by that level of openness and hope that I will speak the same when I have an exhibition. It felt very much as if Heidi’s art always comes first, her ego a distant second. I leafed through the selection of unframed prints and one in particular caught my eye. You know how it is – you never know when you will see something you have to possess, but possess it you must. 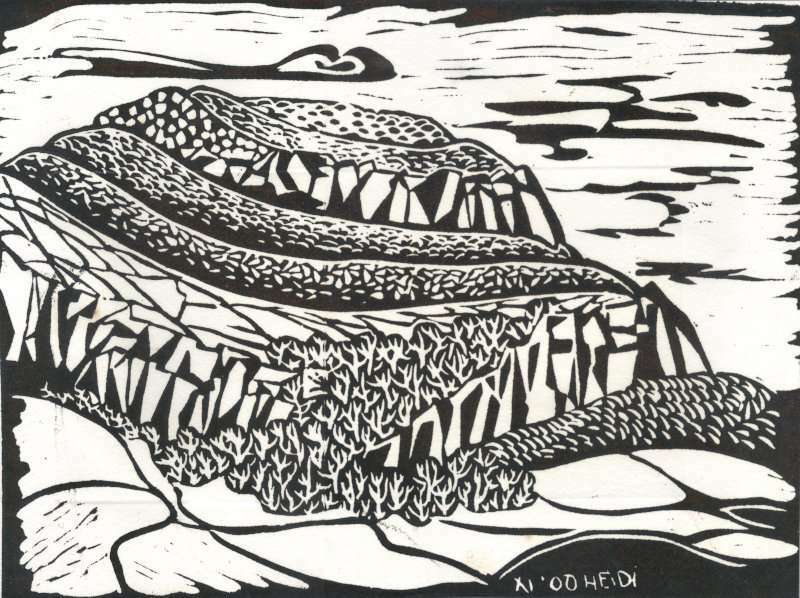 It was a linocut of Mulloughmore, one of the most beautifully-slumped hills you will ever see, part of the Burren in Co. Clare. I love it for its beauty, but also for its completely wild and unspoilt nature, and also because as an ex-geologist I know how it got there and what long-extinct sea creatures’ shells make up the hill. “I prefer this one,” he said picking out the same image, made in black and white. There ensued much muttered argument (the gallery is small) I am afraid to say I bought both. We stopped in the Gallery Café in Gort for a quick bite, as we had to collect our youngest, Olivia, from her new Tae Kwon Do class. I was prepared to sketch, and looked around to see what I fancied drawing. 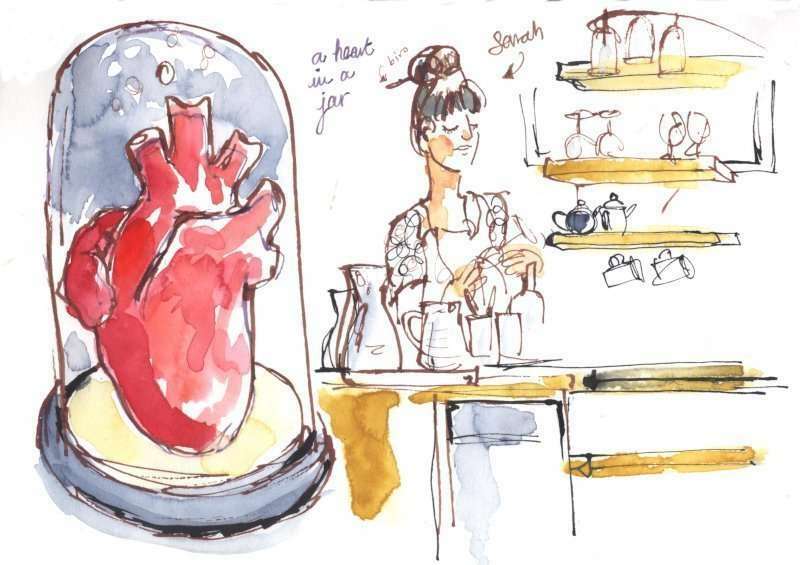 On the table was a papier maché heart in a bell jar. Clearly, there was no contest, and I got stuck in. “This is going to be a bit boring for me,” said Marcel. Then a friend passed. We greeted each other and after she had gone, I realised I suddenly couldn’t remember the name of her girlfriend, a woman in whose company I have spent many hours. I blame it on the wine I’d had in the exhibition. “If I go through the alphabet, it’ll come to me,” I said. Luckily her name began with A, and I can chat while I sketch, so it wasn’t too bad. I loved that heart. And I was most impressed by Sarah, who runs the café: anyone who thinks a heart in a bell jar would make a good table decoration is pretty cool in my book. I was glad to draw her. She made a great subject, partly for her elegant shape but mostly because she made minimal movements, drying wine glasses and discussing orders with the wait staff. And so a cold and miserable November day was filled with art: cinema, amazing architecture, a print exhibition, some wonderful art to take home and even some sculpture. Terrific. Had our first snowfall of the season ( a tad early).. 10 inches caused a bit of chaos even for us seasoned New Englanders… it was a beautiful day that ended with your post. Liked the color and the black and white too… loved the heart best! !